Each April, the Dallas Art Fair transforms the cultural landscape in North Texas when galleries from around the world join local stalwarts, bringing area audiences a cornucopia of exceptional contemporary art. This annual spring migration to Dallas, now in its 9th iteration, has also generated a new group of collectors energized by what they are seeing. Patron checked in with a few of them about their prior Dallas Art Fair acquisitions and invited them to share notes on available works of interest from the 2017 exhibitors. Molly Bruder has contemporary art encoded in her DNA. She is the daughter of Becky Bruder, a former art advisor and one-time business partner with Dallas Art Fair co-founder Chris Byrne. Over the past 10 years, she has come to appreciate the regular visits to museums and galleries she made as a child in the company of her mother. The early exposure paid off for Molly and her sister Anne, who followed in her mother’s art-enthused footsteps. Anne currently resides in New York, where she works for Worth Art Advisory. Newly engaged, Bruder says that she and her fiancé enjoy acquiring work by younger artists. She credits her sister with bringing her to art fairs in Miami and Basel, as well to the local event. At last year’s Dallas Art Fair, they bought Margaux (Maggie) Ogden’s Mass Sext from Johannes Vogt Gallery of New York. “We were drawn to the whimsicality of it, and we just had a visceral reaction to it,” she says. Bruder is also looking forward to visiting Jessica Silverman Gallery to see TP2 Eastbound by Hugh Scott-Douglas. “I am intrigued by the medium he uses to print trade routes onto his canvas,” she says of his work, which is comprised of a UV-cured inkjet print and digitally printed polyester resin on canvas. “Early on we started making the Dallas Art Fair a hooky day on Friday,” says Gowri Sharma. She and her husband, Alex, have an eclectic collection that began with traditional Indian work. At this point, it spans continents, artists, and media, many discovered at the fair. And the process of learning about new work is as exhilarating as its discovery. They are also excited to see new work each year, especially with the continuing influx of galleries from abroad. The Sharmas are careful collectors. “We often start with a small piece by an artist and live with it. Then we think, ‘Oh, if we can just get a big one,’” Gowri says. In some cases, the big one still manages to make it home with them. Such is the case with the work by Nabil Nahas that they purchased at last year’s art fair from the Dubai-based gallery, Lawrie Shabibi. “We both fell in love with this,” Gowri says. “It’s a piece of art that takes you to a different place,” she says of the work. Its provenance is equally exciting. “Contemporary Middle Eastern art is so new. It’s so ground floor,” says Alex. The Sharmas have attended art fairs all over the world, but are most impressed with this one. “There is a camaraderie in Dallas. It’s a testament to what Chris (Byrne) and John (Sughrue) have done,” they conclude. 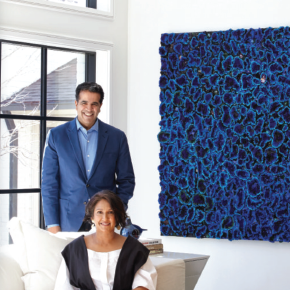 Having recently returned to this area after several years of living on the East Coast and abroad, last year was the couple’s first year to attend the Dallas Art Fair. They went with their friends Bill Carr and Michael Pappas, whose encouragement was infectious. It was there that Laura saw Line of Reason by Yamini Nayar in the booth of San Francisco-based Gallery, Wendi Norris. One of its interesting aspects is its process. “She builds a diorama using found objects. You can see some things that are familiar but very abstract. She takes an aerial photo of the diorama. She then destroys the original diorama and rebuilds it,” Laura explains. The new rendering, which she then photographs again, creates a new, dimensional abstract work. “I think this is the most interesting, thoughtful work we have bought,” Michael adds. Commenting on work at this year’s fair, Laura says, “One work that stood out will be on display at Tim Van Laere Gallery. It is a charcoal work called Robert Always Resisted Giving Any Kind of Explanation, by Rinus Van de Velde.” They are also fans of Ronchini Gallery, where Michael looks forward to seeing the work of Gianpietro Carlesso. He says, “Carlesso’s Curvature series contemplates infinity, and this piece in marble looks stunning. Sculpture is even tougher than two-dimensional artworks to assess through an image, so we can’t wait to see it in person.” Laura looks forward to seeing the work of Paolo Serra, also at Ronchini. From Taubert Contemporary, the couple looks forward to Methadone by Beate Geissler and Oliver Sann. “Methadone provides immediate visual interest—bright, cherry red, viscous, and beautiful. But beneath this interesting image, one confronts its darker title, which is timely with the epidemic of opioid addiction in our country. And as we understand it, the artists—who are a couple—created the piece in reflection of our dependence on oil and fossil fuels,” they say. “Among more established artists, we will take a look at Ellsworth Kelly’s Color Square 2 at Talley Dunn Gallery and Tracy Emin’s Its different when you Are in Love at Lehmann Maupin. In the case of Kelly, it is a typically minimalist, five-color lithograph. In the 1990’s era of Young British Artists and Charles Saatchi’s collection, Emin was one of the first young artists we became aware of. These days, she is part of the firmament, and this neon piece is characteristically confessional and intimate,” Michael explains. In speaking with these collectors, they appreciate the top-flight exhibitors and breadth of strong work at Dallas Art Fair, noting its tremendous benefit to the city. They also emphasized the importance of local institutions—Dallas Contemporary, Dallas Museum of Art, and Nasher Sculpture Center—all beneficiaries of Dallas Art Fair and organizations vital to the cultural life in the area.